New Rituals Connect The Exodus of Passover To The World's Refugee Crisis : Goats and Soda It's one of several suggestions that connect the ancient holiday, remembering the Israelites' flight to freedom, with the world's current refugee crisis. Next week, between 150 and 200 people will gather for a Passover seder at Temple Beth-El in Richmond, Va. When the traditional Passover question is posed — "Why is this night different from all other nights?" — there's a new answer. Guests at the Seder, co-sponsored by the refugee aid agency ReEstablish Richmond, will include about 50 locally resettled immigrants from Afghanistan, Iraq and Syria. Passover, after all, is the ultimate refugee holiday. It's about an ancient flight to freedom by Israelites who were oppressed in Egypt. And the world is currently facing an unprecedented refugee crisis, with 65.3 million refugees worldwide. One new version of the Haggada, from the American Jewish World Service, makes a direct connection: "Around the world today, courageous people are making similar journeys — leaving behind violence, poverty and persecution and seeking security, freedom, prosperity and peace." 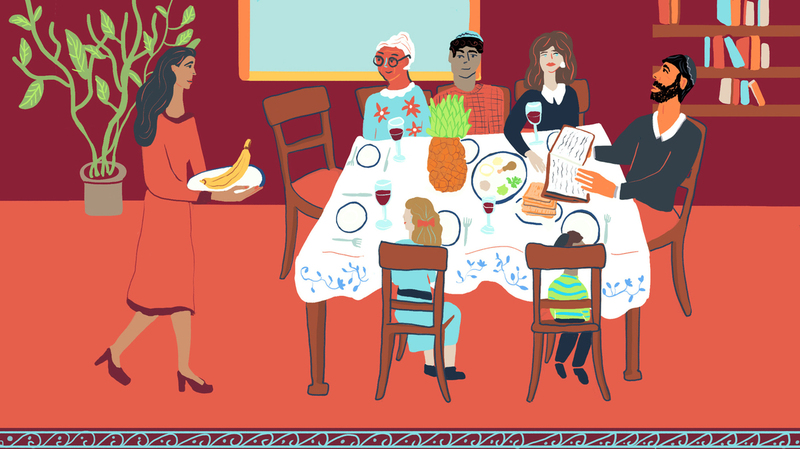 Against this backdrop, a number of Jewish organizations are offering new readings and rituals to include at the festive meal known as the Seder. These additions, says Rabbi Jonah Dov Pesner, director of the Religious Action Center of Reform Judaism, are in keeping with the fact that the Haggada — the text read at the Seder — has always been flexible, "less of a fixed text than a user guide to tell the story." Here are some suggestions from Jewish organizations to link the ancient holiday with the current crisis. Think of it as three more questions to add to the traditional four. Why put tropical fruit on the table? Both the banana and the pineapple are being suggested as additions to the Passover table. The banana is a connection to the story of 3-year-old Syrian refugee Aylan Kurdi, who drowned on a beach in Turkey in 2015 on the cusp of reaching safety. In different interviews, the father of Aylan and his 5-year old brother (who also drowned) said he'd bring them a banana as a treat. This ritual was introduced last year by Rabbi Dan Moskovitz, of Temple Sholom Vancouver, British Columbia — the city where Aylan's family had hoped to settle. The pineapple has been a traditional symbol of welcome and hospitality since colonial times because of its exotic pedigree and rich flavor. In bygone days, a pineapple on the table demonstrated that the hosts had gone to special trouble to welcome and honor their guests, says Rabbi Ronni Handler, executive editor of ritualwell.org of the Reconstructionist Rabbinical College. The fruit has another connection to the holiday of Passover, with its focus on the lives of Jews as slaves in Egypt. Pineapples were often farmed by slave laborers in the colonial era. "As we tell the Passover story each year, we relive our own Exodus," says Rabbi Jennie Rosenn, vice president of community engagement at HIAS, formerly known as the Hebrew Immigrant Aid Society, which focuses on protecting and aiding refugees. The HIAS Passover supplement encourages participants to think about what necessary or treasured object they would take on a journey to freedom. It also provides examples of actual objects taken by recent refugees, like Farhad, who hid a photograph of his mother under his clothes when smugglers told him to throw everything away as he escaped Afghanistan; and Sajida, who kept the necklace her best friend gave her to remember her childhood in Syria. Why put shoes on the doorstep? HIAS also suggests continuing a ritual the organization introduced last year: putting a pair of shoes on the household doorstop to symbolize the fact that Jews have stood in the shoes of the refugee. This also provides an opportunity for Seder participants to discuss their own family journeys. For Rabbi Pesner, the contemporary immigration crisis echoes the story of his Grandma Fanny, who in 1916 at age 16 fled pogroms in Russia for a new life in America. And that's why Rabbi Knopf will be placing a pair of shoes at the door for the Interfaith Refugee Seder in Richmond on April 11, the second night of the holiday.